North of Stansbury on Yorke Peninsula (South Australia), towards Port Vincent, there is an interesting hike along the beach at low tide. Prominent cliffs of yellowish fossiliferous limestone overlain by reddish sand and mottled clay are in places capped by white carbonate-rich silts and hard limestone called ‘calcrete’ (1). The cliffs are up to 20m high except where broken in a few places by gullies that mark once active, short streams. At high tide the sea laps at and erodes the base of the cliffs across a shore platform cut into the limestone. The limestone beds (Port Vincent Limestone) were deposited in Oligocene to Miocene times, roughly 20-30 million years ago. The overlying reddish sands and clays (Hindmarsh Clay) are probably around 700,000 years old (Pleistocene age) and the white carbonate (lime) capping is even younger. At the Stansbury jetty, the cliffs are mostly of Port Vincent Limestone. The original bedding in the limestone is outlined in places by thin rubbly layers and elsewhere by shell-rich beds. The limestone was deposited in shallow seas that once occupied the St Vincent Basin. Conspicuous amongst the fossils are whole-shell sea-urchins (echinoderms), bivalves (clams and oysters) and bryozoa in a sandy matrix that is largely made of shell fragments (4). The cliffs show spectacular evidence of former caves, sinkholes, pipes and other solution features: these are obvious because they are filled with mottled green, yellow and red sandy clays (2, 3). Undercutting by the sea has progressively collapsed the limestone to expose these structures and in places wash out the clays. The caves and pipes characteristically have smooth surfaces dating from a time when lime-rich solutions seeping over their walls precipitated calcite on evaporation. 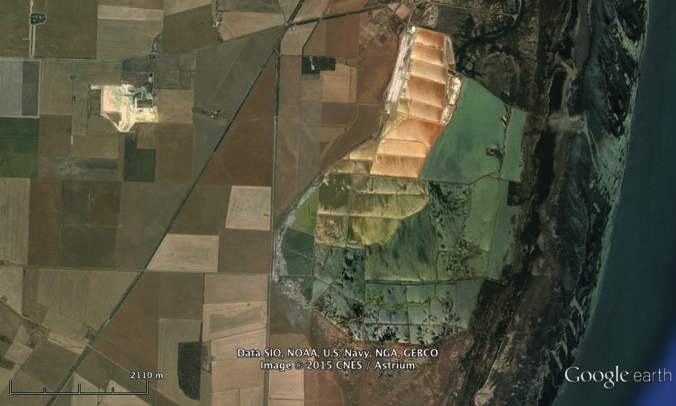 In the section from Beach Point (Long Beach) northwards, the Port Vincent Limestone is overlain by Hindmarsh Clay, a thick band of mottled green-yellow clays and deep red sandy clays. In contrast to the marine origin of the limestones, these were deposited during the Pleistocene in fluvial environments. The boundary between the two formations is important as it represents a large time break of several million years, during which the seas retreated from St Vincent Gulf to well south of Kangaroo Island. As this was happening, in the Late Tertiary period, the changing conditions exposed the limestones at the landsurface and subjected them to erosion, weathering and dissolution to generate a significant karst (caves, sinkholes, pipes, and the like) landscape. Major riverine and lake environments later became established in the former gulf. The river systems drained highlands to the north and generated widespread alluvial and lacustrine deposits of sand and clays over the karst limestone, filling the caves and sinkholes to produce the remnants we see in the cliffs today. It’s interesting to speculate as to whether the remains of any fauna (including megafauna) occur within this cave and sinkhole landscape. It did, after all, form at about the same time as the extensive cave systems in the limestones of the South East and the Nullarbor which contain abundant mammalian and other fossils. A feature of the Hindmarsh Clay is the occurrence in places of white bands of the mineral alunite (potassium aluminium sulfate). Towards the northern end of Long Beach it was sufficiently abundant for local entrepreneurs to begin to mine it to produce potassium sulfate fertilizer (according to a report by RL Jack, Assistant Government Geologist, in 1918), which was in short supply during the First World War, but the venture failed. Remnants of mining operations can still be seen at the base of the cliffs behind sand dunes (5). The alunite was formed from a reaction between acid groundwater and potassic clays in the sediments. The process in detail is unclear, but the occurrence of alunite in superposed near-horizonal seams suggests that appropriate conditions may have related to flow of local acid groundwater. Above the Hindmarsh Clay in most of the cliff-line is a ‘blanket’ of younger Pleistocene lime deposits. These consist of unconsolidated silts with interlayers of hardened calcrete. The youngest calcrete is exposed as sheets over large areas of the landsurface on this part of Yorke Peninsula, and was exploited in earlier days for the local production of quicklime. It remains an impediment to cropping but is progressively being crushed and disaggregated by farmers using heavyweight rollers hauled behind large tractors. The unconsolidated carbonate silts are considered to be a loess-like aeolian deposits whereas the calcrete bands are likely to represent the remnants of ancient soils that formed at successively younger times. What else can we note about the geology of the Stansbury cliffs? Projecting the top of the cliffs seawards provides an indication of the former extent of the Pleistocene landscape that has now been disrupted and incised as the St Vincent ‘valley’ was drowned by rising seas. Fallen blocks accumulated at the base of the cliffs is the result of mass collapse of limestone and calcrete in the cliffs caused by back-wasting under the attack of waves. Some rock fragments are very large; others are small and part of a lag concentrated by tides at the back of beach. Many are angular, which indicates that they have relatively recently fallen from the cliff; some are rounded and smoothed which indicates that they have been washed around in the surf zone for a long period of time. It’s interesting to speculate about the time that it takes the cliff to retreat under the attack of the rising sea. Only observations over the long-term (mapping of fallen blocks or reference to old photographs to compare with the present) might answer this question. However, most cliff erosion is likely to take place at comparatively rare times of severe storms and powerful wave and wind attack, whereas little change occurs under usual weather conditions. The cliffs in some places are coated with a ‘wash’ of sediment from higher in the sequence, and this sometimes obscures the geology and makes it difficult to pinpoint breaks in the rock sequence. This coating varies from a thin surface veneer to substantial talus deposits, and usually occurs in places where the cliff is less exposed to wind and waves. As well, in places, the red sand and clay fill in the old caves and pipes has spilled out from the cliffs where erosion has exposed them. Collapsing masses of rock, spilling of sands and clays from less coherent deposits, breaking apart and exposure of karst features, and wash over cliff surfaces, are all components of cliff retreat in this region. It’s interesting that the cliffline can be traced from actively eroding beach cliffs north of the jetty at Stansbury to a subdued hillslope at the back of the town to beach cliffs again south of the cemetery. The townsite is actually an embayment that was filled by shallow water shelly limestones (deposited around 10,000 years ago in seas that were at a slightly higher level than today) and covered by more recent sand dunes. 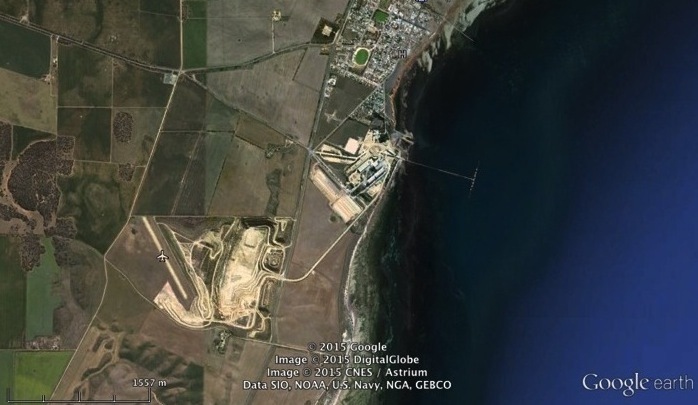 It seems to have been a quirk of nature that preserved the embayment, in much the same way that winds, tides and seawater circulation on this eastern side of the gulf produced distinctive, recurved sand and mud spits that protect other bays like Stansbury. RP Bourman, CV Murray-Wallace, N Harvey (2016) Coastal Landscapes of South Australia. (University of Adelaide Press: Adelaide). 423pp. AR Crawford (1965) The Geology of Yorke Peninsula. Bulletin No. 39. Department of Mines, Geological Survey of South Australia. 139pp. RL Jack (1918) Alunite deposits, Section A. Hundred of Ramsay. InSouth Australia Department of Mines, Mining Review No. 28 for the half-year ended June 30th, 1918. pp51-53. AR Milnes, JT Hutton (1983) Calcretes in Australia – a Review. In ‘Soils: an Australian Viewpoint’, Chapter 10, 119-162. (CSIRO, Melbourne/Academic Press, London). WJ Stuart (1970) The Cainozoic stratigraphy of the eastern coastal area of Yorke Peninsula, South Australia. Transactions of the Royal Society of South Australia 94, 151-178. 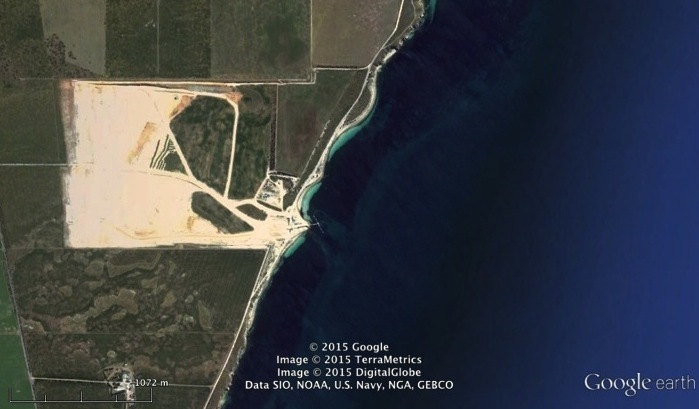 This entry was posted in Australian earth history, environmental management, Geosciences education, Landscape evolution on February 15, 2019 by tony milnes. Douglas Mawson was born on May 5, 1882 at Shipley in Yorkshire and migrated in 1884 to Australia with his parents Robert and Margaret and older brother William. From 1895 to 1898, William and Douglas attended Fort Street Model Public School in Sydney, one of the best public secondary schools in Australia. From 1899 to 1901, Douglas Mawson studied Mining Engineering at the University of Sydney, graduating on April 19, 1902. Mawson’s best results were in geology under the influence of TW Edgeworth David, the charismatic Professor of Geology at the time. This was the start of a lifelong friendship and professional association, which ended only on David’s death on August 28, 1934 (Corbett 1998, 2000). In 1902 Mawson commenced a Bachelor of Science degree, majoring in geology. This was interrupted by him spending several months (April to September 1903) studying the geology of the New Hebrides (modern Vanuatu) at the behest of Edgeworth David. Mawson graduated with a Bachelor of Science in early 1905 and commenced an appointment as Lecturer in Mineralogy and Petrology at the University of Adelaide on March 1, 1905. The only other geologist at Adelaide University at the time was 60 year old Walter Howchin. After arrival in Adelaide, Mawson was very active and in particular studied the geology of the Broken Hill area and the neighbouring Olary area in South Australia. Here Mawson found Precambrian rocks that he considered to have been deposited by glacial action. He wished to see modern glacial activity and in late 1907 contacted Edgeworth David, and through him, Ernest Shackleton, the leader of the 1907-1909 British Antarctic Expedition (BAE). As a result, he was appointed as physicist to the expedition. The BAE was based on Ross Island. Highlights of this expedition for Mawson were participation in the first ascent of Antarctica’s only active volcano, the 3794m high Mt Erebus, and membership of the first party (with Edgeworth David and Alistair Mackay) to reach the vicinity of the South Magnetic Pole. David and Mawson returned to Australia as heroes. Later in 1909, Mawson found time to continue his Broken Hill studies and completed his doctorate before the end of the year. While working in Broken Hill, Mawson met Paquita Delprat, a daughter of Guillaume Delprat, the General Manager of BHP, whom he later married. Mawson visited London in late 1909 and unsuccessfully tried to persuade Scott to land him at Cape Adare, in order to study the geology of the area. He then organised the Australasian Antarctic Expedition (AAE), the story of which has been well documented by Mawson (1964), Ayres (1999), Hall (2000), Fitzsimons (2011) and particularly by Riffenburgh (2011) who gives the most comprehensive account. The AAE was most notable for Mawson surviving and struggling back to the base at Commonwealth Bay after the deaths of Belgrave Ninnis and Xavier Mertz, his sledging companions on the Far Eastern Party. The boat had already left and Mawson was obliged to stay in Antarctica for another twelve months with six members of his party, led by Cecil Madigan, who had stayed behind. As part of the AAE, bases were also established on Macquarie Island and the Shackleton Ice Shelf. The AAE saw the first use of radio communications with Antarctica. Mawson was knighted in 1914. He was in the UK from 1916 as part of the war effort, returning to Adelaide in April 1919 where he was appointed Professor of Geology and Mineralogy at the University of Adelaide in 1921, a position he held until his retirement in 1952. For the next few years Mawson was involved in raising funds to pay off the debts of the AAE and in organising the publication of the scientific reports resulting from the expedition. He was an enthusiastic field geologist and did considerable field work in the Broken Hill/Olary and Flinders Ranges areas, usually accompanied by students. In the summers of 1929-30 and 1930-31, Mawson led the ship-based British, Australian and New Zealand Antarctic Research Expedition (BANZARE) using the Discovery, the ship used by Scott in his first expedition in 1901-04. This was a largely marine science, oceanography and biology expedition, but included landing on Heard Island and a visit to Mawson’s old headquarters at Commonwealth Bay. On the second voyage, Mawson claimed formal possession of King George V Land on behalf of Britain. This is the basis of the present Australian claim to what is termed the Australian Antarctic Territory, which represents about 40% of Antarctica. Mawson continued his field work in the Flinders Ranges in the 1930s and 1940s. He was a driving force in the establishment of ANARE (Australian National Antarctic Research Expeditions) that still runs the Australian Antarctic research activities. He continued to publish research papers until his death on October 14, 1958. The University of Adelaide and the adjacent South Australian Museum have displays where Mawson memorabilia can be viewed. The Tate Museum in the Mawson Laboratories in the University at the corner of Frome Road and Victoria Drive has a display showcasing Mawson’s Antarctic activities on its southern wall. Some of the rocks collected on the Australasian Antarctic Expedition of 1911-14 are housed in the display cases and there is a substantial further collection in the basement crypt archive (where some sample boxes containing these specimens are as yet unopened). One of the AAE sledges is on the north wall of the Tate Museum. On North Terrace, at the entrance to the University just west of the Bonython Building, there is a bust of Mawson which was unveiled in 1982 on the occasion of the Fourth International Symposium on Antarctic Earth Sciences, held in Adelaide to commemorate the centenary of Mawson’s birth. At the foot of the bust are two large boulders: one is charnockite from near Mawson Station in Antarctica and the other is pegmatite from Arkaroola in the northern Flinders Ranges. A recently revamped Australian Polar Exhibit at the South Australian Museum, just to the west along North Terrace, deals with Mawson’s three visits to Antarctica, as well as his work in the Flinders Ranges. There are numerous artifacts from this work as well as some general information on Antarctica. There is also reference to the other two major Australian polar explorers from the pre-World War II era, namely Hubert Wilkins and John Rymill, both of whom were born in South Australia. Ayres, P, 1999. Mawson. A life. (The Miegunyah Press, Carlton South). Cooper, BJ & Jago, JB, 2007. Mawson’s earliest (1906) report on the geology of the Flinders Ranges. Transactions of the Royal Society of South Australia, 132, 167-174. Corbett, DWP, 1998. Douglas Mawson: The geologist as explorer. Records of the SouthAustralian Museum, 30,107-136. Corbett, DWP, 2000. A staunch but testing friendship: Douglas Mawson and T.W.Edgeworth David. Records of the South Australian Museum, 33,49-70. Fitzsimons, P, 2011. Mawson and the Ice Men of the Heroic Age: Scott, Shackleton andAmundsen. (William Heinemann, North Sydney). Hall, L, 2000. Douglas Mawson: The life of an explorer. (New Holland, Sydney). Jacka, FJ, 1986. Mawson, Sir Douglas (1882-1958). Australian Dictionary of Biography. (http://adb.anu.edu.au/biography/mawson-sir-douglas-7531). Jago, JB & Pharaoh, MD, 2016. Pre-Antarctic Mawson in South Australia and western New South Wales. Transactions of the Royal Society of South Australia, 140, 107-128. Jago, JB, Pharaoh, MD & Wilson-Roberts, CL, 2005. Douglas Mawson’s first major geological expedition: The New Hebrides, 1903. Earth Sciences History, 24,93-111. Mawson, D, 1915. The Home of the Blizzard. 2 volumes. (William Heinemann, London). Mawson, P, 1964. Mawson of the Antarctic. (Longmans, London). Riffenburgh, B, 2011. Aurora. Douglas Mawson and the Australian Antarctic Expedition1911-14. (The Erskine Press, Norwich). The Adelie Blizzard: Mawson’s Forgotten Newspaper, 1913, edited by Archie McLean. Reproduced by The Friends of the State Library of South Australia, 2010. This entry was posted in Australian earth history, Geology education, Geosciences education, Glacigene sediments and tagged Education, geology, South Australia on October 8, 2018 by tony milnes. The Tate Museum, at the University of Adelaide, is considered to be the largest and best Australian university geology museum. Although established in the 1880s by Professor Ralph Tate, the foundation Elder Professor of Natural Sciences at the University (1875 – 1901), the Museum was named in his honour in 1902, after his death. It was moved into its current location in the Department of Earth Sciences’ Mawson Laboratories in the early 1950s. The history of the Museum, which is an important part of University Collections, has been well documented by Dr Barbara Kidman. The extensive assemblage of minerals, meteorites, Antarctic rocks and memorabilia relating to Sir Douglas Mawson’s expeditions, as well as rocks and fossils that record important aspects of Australian and South Australian geology, are presently being catalogued and recorded using digital tools not available in past decades. New displays are also being designed. Much of the work is being undertaken by volunteers in lieu of a Museum Curator, a position that has not existed in the Mawson Laboratories for many years. Tate Museum with specimens housed in cabinets matching those made for the first-generation of the museum in the 1880s. Visitors to the Museum, which occupies a ‘foyer’ to the Mawson Lecture Theatre, include University students attending lectures, attendees at Learned Society meetings, parties of school students and off-the-street visitors. All express delight that a historical Museum such as this exists. Research students and staff from within the University, and also overseas, are surprised at the breadth of the mineral and meteorite collections, and occasionally request subsamples for specific research purposes. In this manner, the Museum has an ongoing role in assisting new research and, at the same time, receiving new data and information about its specimens. Visits by parties of school students are especially noteworthy. On Tuesday 8th May, twenty enthusiastic young (7-12years) Science Club students from the Woodcroft State School visited the Museum. Dr Vic Gostin, who often hosts visitors to the Museum, talked to them about the work of Professor Ralph Tate, who studied and maintained collections of Type Specimens of molluscs (including fossil forms) found in South Australia. 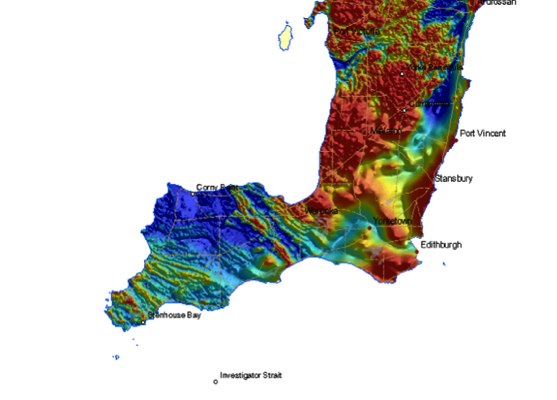 As well, his analysis of the ancient glacial features on Fleurieu Peninsula eventually led to a total paradigm shift to ‘Plate Tectonic’ theory. The students were encouraged to visit the Hallett Cove Conservation Park to view the scientific evidence. Dr Gostin also pointed out the pioneering exploratory work of Sir Douglas Mawson in Antarctica, as illustrated by displays of his Antarctic specimens and memorabilia. A special display of hand-sized meteorites and Australites enabled the students to ask questions and become aware of the asteroid/space connection. Finally, they were allowed to handle and be photographed with the Nakhla Martian meteorite and so, in great excitement, ‘got their hands on another planet’! The 90-minute visit of this keen group of Science Club students was peppered with exclamations and insightful questions, including many about the variety of spectacular minerals on display. The Tate Museum and its collections are recognised by many visitors as an important University asset and scientists like Dr Gostin, who know of its history, say that it generates great interest and provides encouragement for current and potential future earth scientists. Kidman, B P (2015). Ralph Tate, his Natural History Museum at the University of Adelaide and the ‘Tate Museum’. Historical Records of Australian Science, 2015, 101-121. (CSIRO Publishing). This entry was posted in Australian earth history, Geological history, Geosciences education on May 16, 2018 by tony milnes. Subsamples were taken of a collection of fossil shells recovered from a depth of around 3 m in trenches excavated in the Oyster Point Caravan Park by local contractors to improve drainage. Several of the fossils (Fig. 1) had been identified by SA Museum personnel and assigned to species including bivalves Katelysia scalarina and Sanguinolaria (Psammotellina) biradiata, and the large gastropod Turbo (Dinassovica) jourdani. All species are still living around the Australian coast, but these shells are clearly ancient and belong to a time when the coastal cliffs at Stansbury stood inland of the caravan park and the township and are now represented by the base of the hill that runs from the cemetery, northwards behind the town centre, and joins the current shore cliffs near the primary school oval. The seas, of which the fossil shells are a legacy, covered all of the lowland eastwards of these ancient cliffs. The cliffs themselves are in fact cut into much older marine deposits, as can be seen behind the jetty and elsewhere along the coast. These relate to the Tertiary period between 3 to 23 million years ago when much of Yorke Peninsula was inundated by sea. Shell subsamples of two of the species (Katelysia scalarina and Sanguinolaria (Psammotellina) biradiata) were dated in the laboratories of the School of Earth & Environmental Sciences at the University of Wollongong by Professor Colin Murray-Wallace and his colleagues. They used a technique called Amino Acid Racemisation (AAR) and found that the shells are about 125,000 years old. Professor Murray-Wallace can be confident of this dating because he and his colleagues have much experience in determining the ages of ancient Quaternary coastlines of southern Australia and their fossils (see Further reading). Sea levels 125,000 years ago (Fig. 2) were up to 2m above current sea level, as this time was part of an interglacial period (formally called the ‘Last Interglacial’) when ice in Antarctica and elsewhere had melted somewhat due to warmer global temperatures. This accounts for the encroachment of the seas into the embayment now occupied by much of Stansbury township, and the formation of the old cliff-line. The marine and coastal deposits generated at this time, and which occur widely around South Australian coasts, are referred to the Glanville Formation. It might be of interest to note that several earth scientists, including Professor Murray-Wallace, have written a book on the coastal landscapes of South Australia. This is currently in press and should be available soon. It includes a chapter on the entire coast of Yorke Peninsula, including Stansbury. As well, a student from the School of Earth & Environmental Sciences at the University of Wollongong (Tsun-You Pan, visiting from Taiwan), and supervised by Professors Murray-Wallace and Bourman, has recently commenced a PhD research project on the Last Interglacial coasts and their deposits on southern Yorke Peninsula and may be able to report in future on his findings on these materials, including the Stansbury Caravan Park fossils. Bourman, R.P., Murray-Wallace, C.M. & Harvey, N. (2016, in press). Coastal Landscape of South Australia. University of Adelaide Press. Ludbrook, N.H. (1984). Quaternary molluscs of South Australia. Handbook No. 9, 327pp. Department of Mines & Energy South Australia. (Government Printer: Adelaide). Murray-Wallace, C.V., Bourman, R.P., Prescott, J.R., Williams, F, Price, D.M. & Belperio, A.P. (2010). Aminostratigraphy and thermoluminescence dating of coastal aeolianites and the later Quaternary history of a failed delta: The River Murray mouth region, South Australia. Quaternary Geochronology Vol. 5, pp28-49. Zang, W-L, Cowley, W.M. & Fairclough, M. (2006). 1:250 000 Geological Series – Explanatory Notes. Maitland Special South Australia. Sheet S153-12 International Index. 62pp. Primary Industries and Resources SA (Government of South Australia). Fig. 1 Assemblage of fossil shells found in excavation. Fig. 2. Sea level curve for the past 130 000 years. Adapted from Lambeck and Chappell (2001). The thickness of the line of the curve is an expression of the degree of uncertainty of the calculated sea-levels. During the Last Glacial Maximum sea level was about 120 m lower than at present. The Last Interglacial warm period occurred about 130 000 to 120 000 years ago, when sea level was at least 2 m higher than at present. The present interglacial warm period (Stage 1) has existed for little more than the past 10 000 years. Source: Cann, J. (2014). Robe Geological trail. 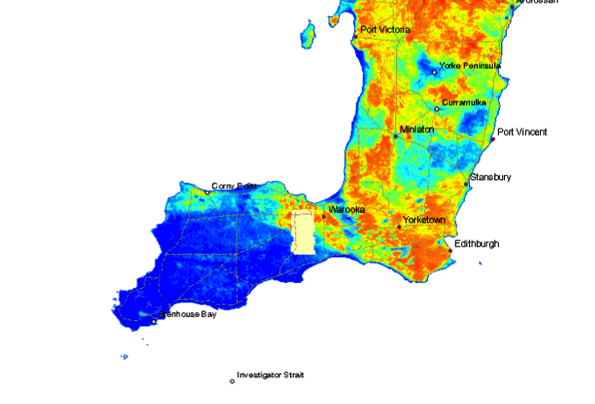 (Geological Society of Australia: South Australian Division). This entry was posted in Geological history, Geosciences education, Paleoclimate and tagged geology, South Australia, Yorke Peninsula on May 29, 2016 by tony milnes. This article was the basis of a talk to a community group (‘Friends of Gulf St Vincent’) based in Adelaide, South Australia , which is committed to improving the ecology and amenity of the Gulf St Vincent biozone. It was one of several talks given at a gathering of members of the Group and the local community in the Community Hall at Pine Point, a small village on the eastern coast of Yorke Peninsula. The focus of the meeting was the possible impacts on Gulf St Vincent of an impending open-cut iron ore-copper-gold-uranium mine nearby (Hillside Mine), but broader issues of environmental impacts and controls were discussed. Having earlier prepared and submitted a response to the Government regulator on the proposing Company’s submission of a mine and environmental management plan, my presentation at this meeting was broadly to overview mining and mine environmental management on Yorke Peninsula (in 20 minutes or so). When faced with making a presentation on mining and mine environmental management, which is one of the issues that local communities are finding it increasingly difficult to deal with, I find it interesting and somewhat enlightening to take a step back and look at some history. Community perspectives on industry, and especially coexisting with large-scale industry, has changed in Australia over the decades. Perhaps with a historical perspective in mind, it might be possible to map a pathway forward to a productive and acceptable coexistence? The following notes for my presentation are basically dot-points from a series of ‘slides’ which summarise the approach I’d taken in my presentation. I’m not sure how it went. Calcrete mined almost everywhere for local building stone & lime mortar. Lime kilns were very common & lime was exported to Adelaide. Getting back to mining – what about minerals exploration? Basically, minerals exploration is controlled by geology. Main search areas are in the ancient basement rock complexes. 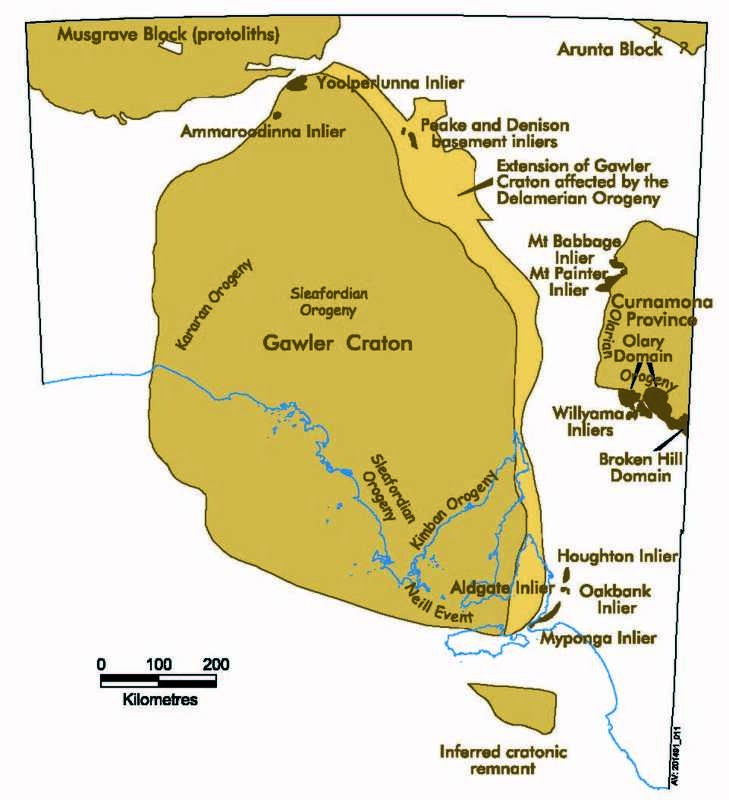 Gawler Craton – Olympic Dam orebody in central South Australia, Wallaroo-Moonta mines in northwestern Yorke Peninsula; Curnamona Province in northwestern South Australia – Broken Hill mines. Company (& shareholders), Government (through royalties & taxes) & Community (employment, local Company spend, services) can all benefit from a mining operation. What about landowners? How is best to benefit neighbouring landholders? Information about what can & can’t be ‘done’ should be readily available & clearly explained to communities. How? By whom? Community lobby can change legislation: best practice environmental management ‘guidelines’ should become ‘requirements’? Cost of mining projects must include the full cost of rehabilitation of project areas to something like that existing pre-mining according to best practice guidelines – not currently the case . Many mining projects would not proceed if this was the case! Mining companies & legislators should include community representatives on site-specific environmental management committees that operate for the term of the project and have ‘teeth’? Community groups must remain active & vigilant? 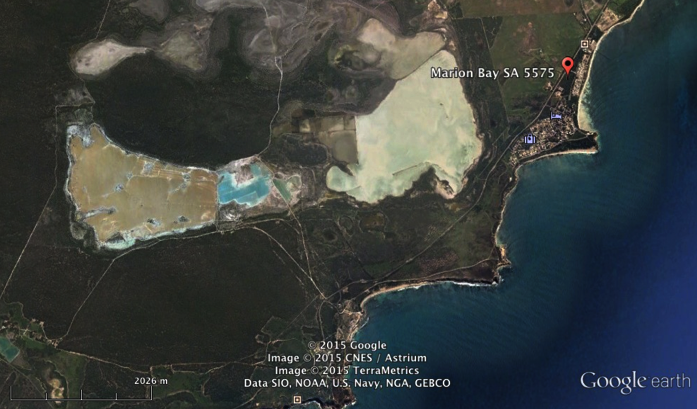 This entry was posted in environmental management, Geosciences education, mine rehabilitation, mining and tagged environmental management, South Australia, Yorke Peninsula on July 7, 2015 by tony milnes.